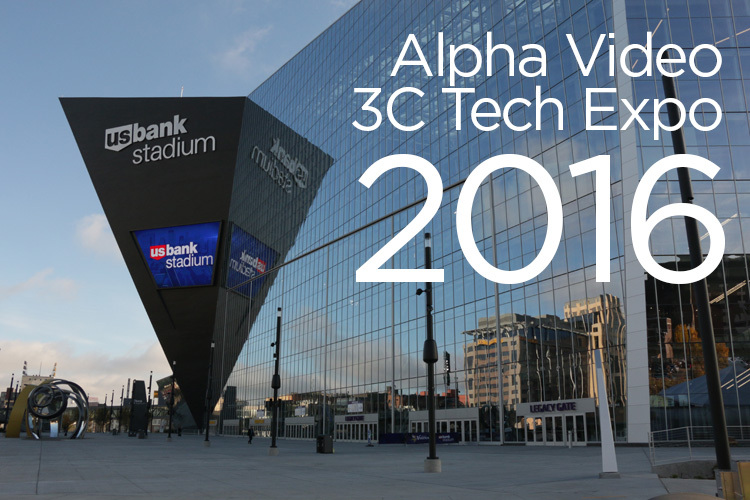 Hundreds of attendees joined Alpha Video on October 19 at U.S. Bank Stadium for a look at the latest in visual communication and collaboration technologies. The South Concourse was lined with over 50 booths featuring all of the leading audiovisual, digital signage, and broadcast manufacturers. The wide range of technology on display showcased Alpha Video’s ability to combine products from different markets to create custom solutions for our clients. The technology was varied enough so that a high school tech coordinator, a corporate IT manager, a broadcast chief engineer, and a city government media manager could all discover solutions that would benefit their organization. A tour of the stadium was offered to attendees that included a visit to the Vikings locker room, the press box, and the 4K/HD video control room. The stop in the video control room included an overview of the technologies that Alpha Video designed and installed for the Vikings. The buffet lunch was followed by a short presentation from Bryan Harper, Vice President for Content & Production for the Minnesota Vikings. Bryan thanked Alpha Video for the video control room work we completed at the stadium. After the presentations, eight lucky attendees won Viking jerseys and three extremely lucky attendees each won two tickets to the November 20 Vikings game. Alpha Video would like to thank all of our clients and partners from making this year’s tech expo such a great success.